Hurt in a Motor Vehicle Accident in Colorado? Accidents involving cars, trucks, motorcycles, pedestrians and other vehicles kill more than 400 people in Colorado every year. Thousands more sustain serious injuries on Denver’s busy I-70, I-25 and I-76. If this has happened to you or a loved one, then you may be confused about your rights or you may have questions about the process of asserting a claim. Our Denver accident attorneys can help you navigate the confusion of a claim and fight for fair compensation. At Lampert & Walsh, LLC, motor vehicle accidents represent more than 90 percent of our practice. Our lawyers that handle trucking and car accidents will guide you through the process, from start to finish. We can assess the insurance company’s offer, help you obtain medical treatment, and give you our honest evaluation. With genuine concern and respect, our counsel can explain your rights and the level of compensation you might expect. With our track record of success, you can feel confident about moving forward from your motor vehicle accident. How Do Liability and Insurance Apply to an Accident? Liability is a legal responsibility to compensate a victim based on fault for having caused an accident. After a car accident, the liable driver generally must pay for your medical expenses, lost wages, and pain and suffering. However, accidents are complex and sometimes the victim is forced to bear the financial responsibility. This may result in the court reducing the victim’s much deserved compensation. The standards in Colorado’s modified comparative fault statute define when you can collect compensation after an accident. If you are found at least 50 percent at fault for an accident, you may be barred from collecting anything. $25,000 per person and $50,000 per accident for bodily injury liability. $15,000 per occurrence for property damage liability. However, these limits are far below anticipated losses for serious truck, motorcycle or car accidents. It is prudent to carry four times that much coverage. It is also imperative to carry both uninsured/underinsured motorist coverage and medical payments coverage to protect your family. This can help you if you are involved in a hit-and-run accident or if an uninsured driver hits you. Why Do I Need Denver Accident Attorneys? ATV rollovers: Unqualified operators, alcohol use and excessive speed over treacherous terrain all contribute to dangerous accidents. Our law firm can identify if any factors, such as obstructed signage or inappropriate warning, contributed to your injury. Boating accidents: Alcohol is a major contributing factor in boat accidents on Colorado lakes. If an inebriated operator caused you to have a boating accident, then you may be entitled to compensation from that negligent party. Car accidents: Driver distractions, such as cellphone use and texting, can be just as dangerous as alcohol and marijuana use. Negligence from rideshare partners, delivery trucks and municipal vehicles can contribute to an accident. Our car accident lawyer can help you identify what or who contributed to your accident. Motorcycle accidents: While there are less motorcycles on the road than other vehicles, the injury and death rates are highest. Riders are at greater risk to injury since they lack bodily protection. Pedestrian accidents: Inattentive drivers, nighttime conditions and pedestrian carelessness can lead to serious and fatal accidents. Improper signage or obstructed warnings can also contribute to these accidents. Truck accidents: Major factors include driver fatigue, aggressive driving and distractions, such as cellphone and drug use, along with equipment failures. Many parties can contribute to a truck accident, including loading and unloading crews. Have you or a loved one survived a pedestrian accident involving a motor vehicle? Has a car accident stopped you from working? Do you have concerns about your existing claim? No matter the facts of your injury, you can rely on us to investigate fully and represent your interests aggressively. We can let you know how we can help with your injury claim at no cost through a free consultation. Our law firm will defend your rights and communicate with you at every step. If you sustained injuries in a motor vehicle or car accident, then let one of our injury attorneys evaluate your claim. 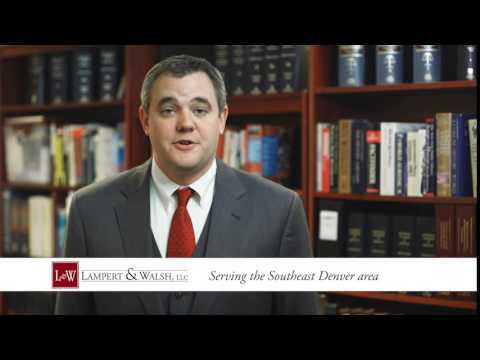 At Lampert & Walsh, LLC, we work on a contingency fee basis. That means we do not charge legal fees unless we obtain a settlement or jury verdict for you. With our experienced team in your corner, we can help you come to a favorable resolution. Call us today at 720-489-5848 or contact our Denver office online.